The cleric didn’t survive the Caves of Chaos, but my love of role playing games did. The next year would see me acquiring several game books of my own and convincing my mother that, despite the protests of the televangelists, there was nothing more dangerous about D & D than any other board game. The campaign continued as Berg the thief joined the group and continued clearing the monsters from the caves. A year later my family and I moved out of that small town in Indiana and went west. It would take a couple of years of adjusting to life in California before I would find new friends that played. By the end of the 7th grade I met some friends that would be a part of my life to this day, and we would spend lunch break in the school library making characters, discussing new games and plans for next game night. With this group of friends I would spend the next few years adventuring in such far flung locales and genres as the gritty rain soaked streets of Cyberpunk’s dystopian Night City, to the four color, comic book, super hero action in Heroes Unlimited. Along the way, many new Dungeons and Dragons adventures would be undertaken, as well as many new versions of the rule system, but, like an addict forever searching to recreate the thrill of the first high, it was never enough. Eventually I would move on to more cerebral games and focus on the Lovecraftian horror of games like Call of Cthulhu and Delta Green. I would swear off the fantasy genre games and in fact, the entire sword and sorcery genre, and my gaming elitism would prevent me from truly enjoying the full range of my hobby for many years. Thanks to others out there with more foresight, many copies of that red box basic D & D game are still out there in varying conditions on the internet, for sale to those of us who discarded it for the newest and flashiest game du jour. I was able to recreate that original set recently and spent some time revisiting that basic D & D system. I found within that red box more than just an extremely dated game supplement with yellowed dog eared pages and notes from 30 years of adventures in the margins, I found the reason that I loved gaming in the first place. 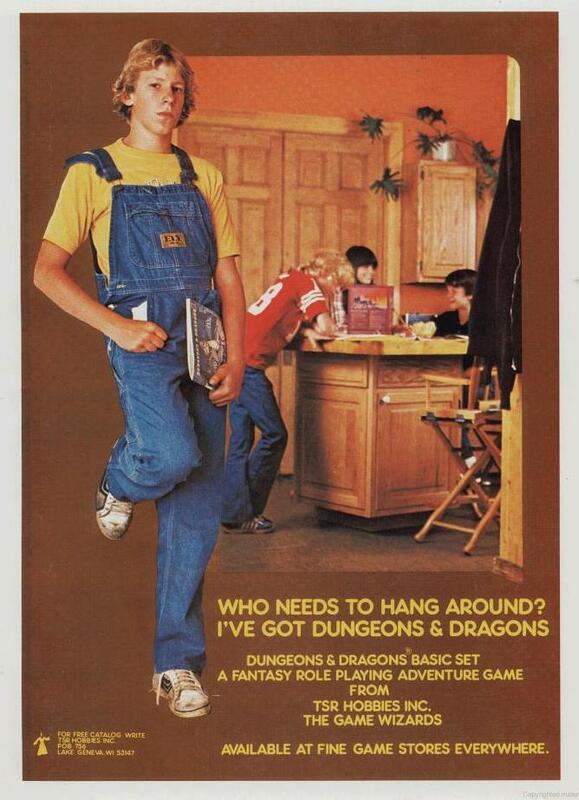 The basic D & D system was so much easier to play than the Advanced Dungeons and Dragons and 2nd Edition systems I went on to play throughout the second half of the 80’s and early 90’s. The focus was on fun and camaraderie, not math and rules minutiae. The Caves of Chaos are ridiculous. A ravine with a dozen or so semi connected caves, filled with all sorts of increasingly difficult monsters. No thought is put into the logic behind these caves and their inhabitants. The ecology of Orcs is never considered here, one does not ask why they would be living side by side with Kobolds, Gnolls, and Goblins, even though, as we all know, they should be getting along as well as the Hatfields and McCoys, allowing the players to stroll on in and collect all off the treasure, of which there is a ridiculous amount in every cave. What use for gold do these monsters have? Why do they have human prisoners alive in these caves? And ultimately, why is this cave full of evil beasties located just three miles from the Castellan Keep? That 1st level cleric isn’t concerned with any of these things though. The only thing he cares about is getting a 12 or better on that 20 sided dice and crushing another kobold skull with his mace.